Last week the music world lost one of its great lights. 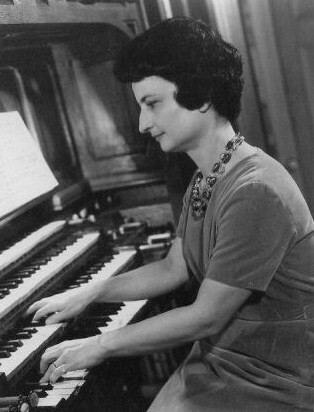 There can hardly be an organist alive who has not been influenced by the work of Marie-Claire Alain — and by her rare personality. I first encountered her directly when she stopped into an organ lesson that I was having with Paul Jenkins when I was a young student. She was to play a recital that evening on the instrument that I was having the lesson on and was having doubts that she wanted to play the Trois danses, by her brother Jehan, which were printed on the program. Mr. Jenkins suggested that she try some other Alain works on the instrument right then and there. By the time they finished, I had heard his sister and chief exponent play almost all the fairly slender catalogue of Jehan Alain. I suspected that my teacher had caused her to do that for my benefit, and I’ve never forgotten it.